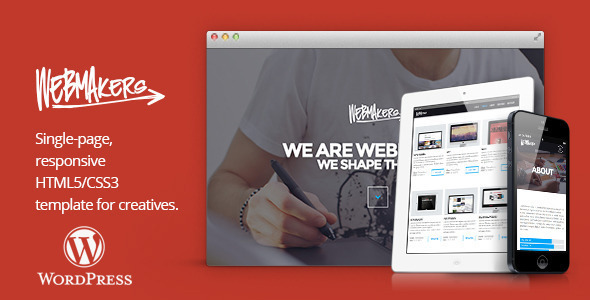 Webmakers is a single page WordPress Theme recommended for creatives, freelancers and agencies. This theme coming with 5 pre-made theme skins, powerful theme options with ability to change typography (choose from standard and 600+ Google webfont with live preview! ), Unlimited colors with colorpicker for theme skin and body background, great custom plugin based shortcode generator to build theme element easily and much more! Customize element colors (unlimited color) via color picker! upload your own image and set it as body background! Fully layered PSD source included!